The incident happened at around 6.15 am Irish time and emergency services are at the scene dealing with the scores of injured. 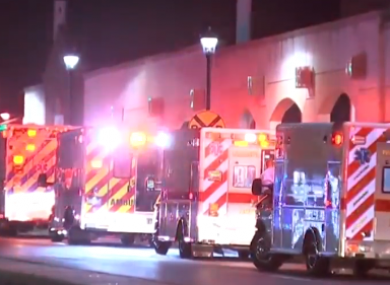 Heather Redfern, a spokeswoman for the Southeastern Pennsylvania Transportation Authority, said a high-speed train ran into another one that was stationary and unoccupied at the 69th Street Terminal in the city’s Upper Darby suburb. “All 42 people on board the train that was moving were injured and all appear to be non life-threatening,” she said, adding the cause of the crash just after midnight was being investigated. “My face hit the wall, put a big hole in the wall and I went straight down and I blacked out. There was blood everywhere. The driver is all banged up and there was this one girl bleeding out of her face pretty bad. Thirty-six people were left with minor injuries when two New York subway train cars careened off the tracks in June. The US rail network suffers from chronic underfunding and accidents are not infrequent, particularly on the busy East Coast corridor. In an early morning briefing, Upper Darby Mayor Nicholas Micozzie said the victims were taken to area hospitals. He says at least four people suffered serious injuries. Email “'There was blood everywhere': Over 40 injured in Philadelphia train crash this morning”. Feedback on “'There was blood everywhere': Over 40 injured in Philadelphia train crash this morning”.